Do you ever crave breakfast for dinner? I get those cravings pretty often and those nights usually have to go unsatisfied. But with White Lily Diner now in the hood, I can get my breakfast fix any time of the day. Located on Queen East, just west of Broadview, this cute Riverdale restaurant is exactly how I’d picture a restaurant with word “diner” in its name. The narrow interior is decorated with wood panelling and shades of retro mustard yellow. 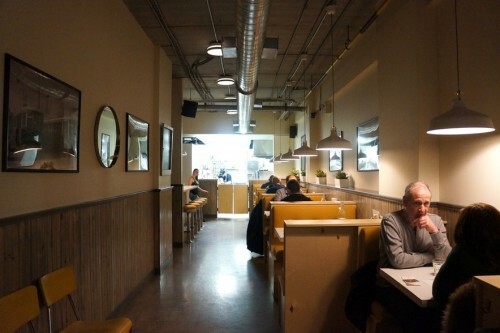 Seating consists of tight booths (you can forget about personal space if you’re in a booth meant for four) as well as a handful of diner stools at the back of the restaurant along the counter. By the looks of it, I don’t think they can accommodate groups larger than four. White Lily Diner is open Wednesday to Sunday from 10am to 10pm and serves an all-day menu created by Chef and co-owner Ben Denham (previously from Electric Mud BBQ). The menu consists of a mix of items you’d expect to find on a diner menu as well as a few unexpected items like a smoked fish platter and a hummus plate. 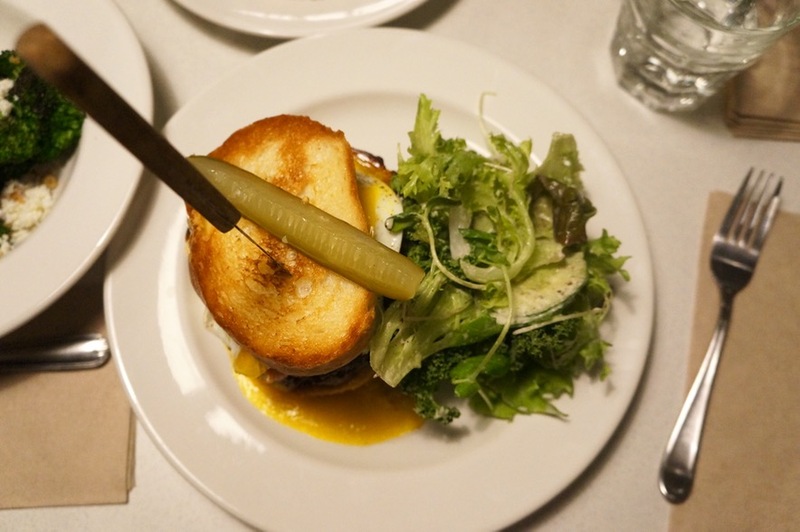 They menu includes an entire section dedicated to patty melts which are a cross between a grilled cheese sandwich and burger. They range in price from $12 for the classic to $18 for the double and are all served with a side of greens. There are also specials for each day of the week so be sure to take a peek at the chalkboard hanging on the wall. 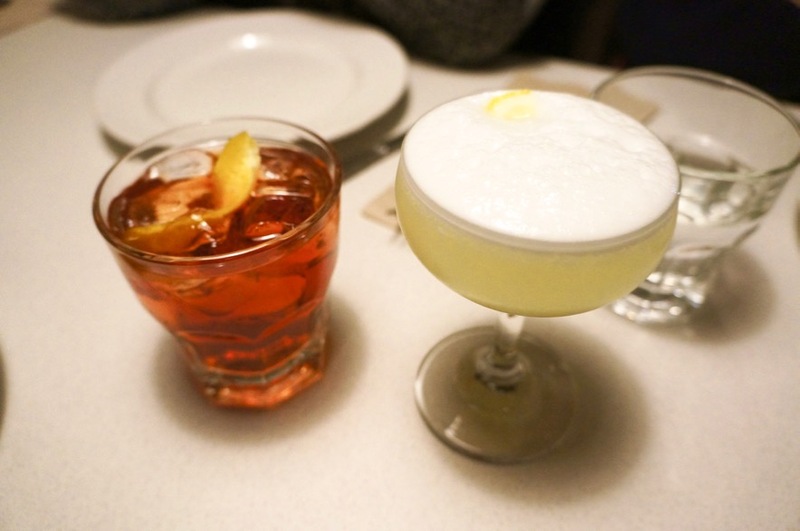 On Saturday nights, they offer a pot roast and $6 cocktails. We took advantage of the $6 cocktails and ordered a Classic Negroni (regularly $10) and a Gin Fizz (regularly $9). If beer or wine is more your jam, they offer a couple draught beers, a small selection of cans/bottles as well as a handful of wines to choose from. For my main, I ordered the Breakfast Patty Melt ­–­ 6oz beef patty, American cheese sauce, poblano relish, bacon, sunny egg ($14). I wasn’t a pretty sight with the runny yolk, cheese sauce and patty juices running down my arms but it was too delicious to care. They pride themselves on making everything in-house here which includes making their own bread and smoking their own bacon. I loved the thick-cut bacon and particularly enjoyed the poblano relish – it didn’t add much heat but added a really lovely sweetness to the sandwich. It might be called a ‘breakfast’ patty melt, but I assure you, it’s just as satisfying for dinner. 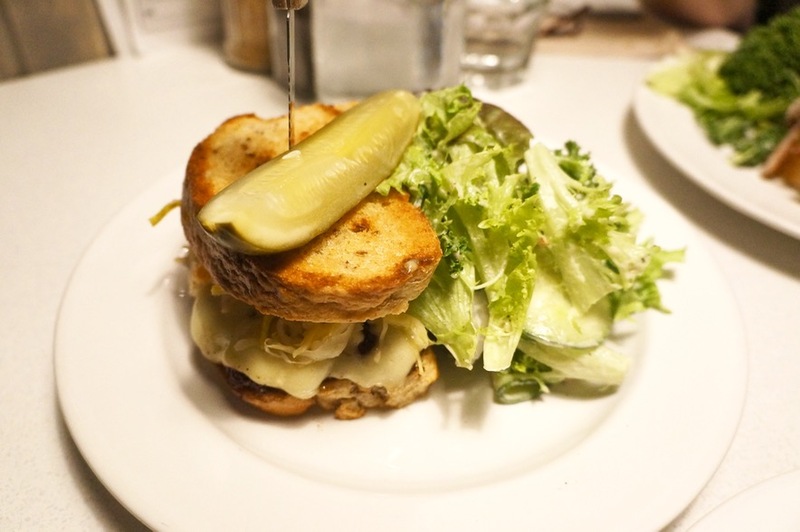 Mike ordered the Reuben – 6oz beef patty, sauerkraut, Russian dressing, swiss cheese, rye bread ($14). On the whole, it was a solid sandwich but we both felt there was something missing. Perhaps, it could’ve used a bit more Russian dressing? It wasn’t a bad sandwich but having just eaten the killer breakfast version, it paled in comparison. Since the kitchen doesn’t have a deep fryer, the patty melts don’t come with fries. Instead, they come with a side salad which made us feel a little less guilty about our meal. But I still couldn’t resist ordering the pan fried Hash Browns with Malt Mayo ($4). 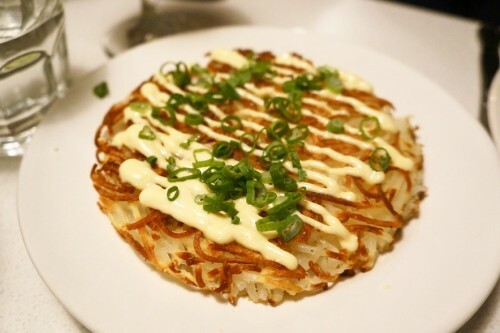 It’s presented as one large hash brown and with the green onions and mayo drizzled on top, it looked like an okonomiyaki. For a pan-fried hash brown, I thought it was pretty successful. 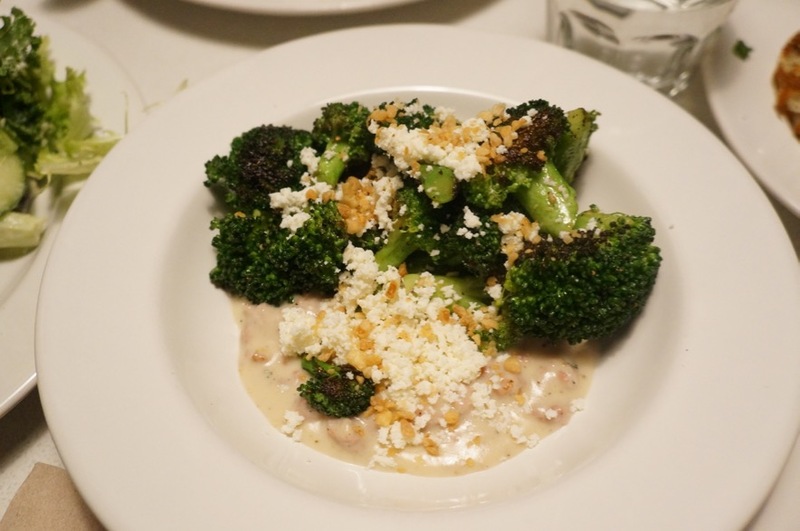 From the ‘seasonal’ section of the menu, we ordered the Charred Broccoli – sausage gravy, aged ricotta, crispy garlic ($8.50). I’m really horrible at incorporating greens into my diet. One surefire way to get me to eat greens is to cover it in sausage gravy. With the chunky gravy, ricotta cheese and fried garlic, it was an explosion of flavours which all worked together incredibly well. Definitely one of the highlights of the meal! White Lily Diner has several sweets on the menu to end your meal with including lemon meringue pie, butter tarts and doughnuts. Doughnuts are my weakness but since we were here for dinner on a Saturday, they were sold out of doughnuts from their brunch service. Instead, we opted for an order of the Butter Tarts – whiskey raisins & maple syrup ($4) which come with two bite-sized tarts. 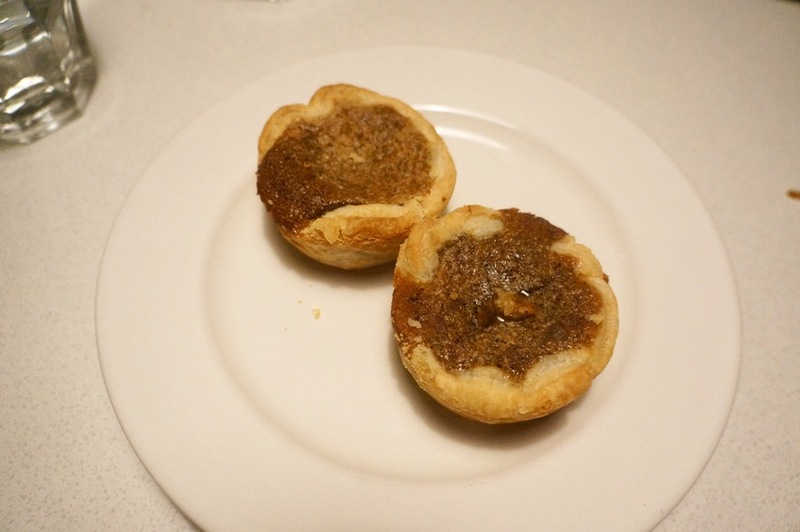 Mike’s the butter tart aficionado in our relationship (I’m not the biggest fan). He thought they they had a great crust and a nice runny filling and while he doesn’t prefer raisins in his butter tarts, he still gave them two thumbs up. 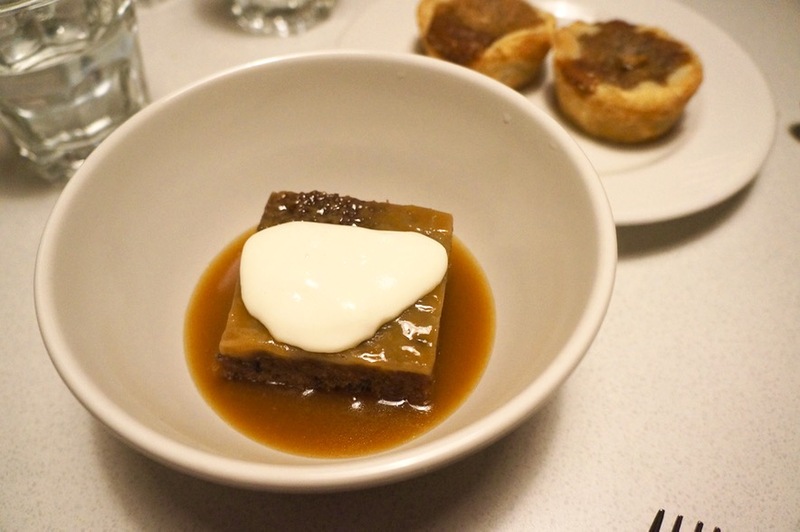 The dessert special of the evening was Sticky Toffee Pudding which was more my cup of tea. There’s something that’s just so comforting about this soft, sweet and gooey pudding. 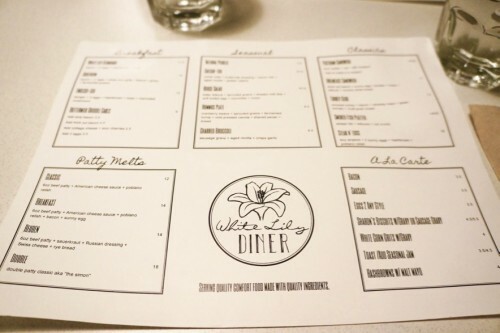 The east end is blessed with an endless number of brunch spots but there’s always room for more great places like White Lily Diner!